Spring finally. Hurray! Is there anything I can ask for more? 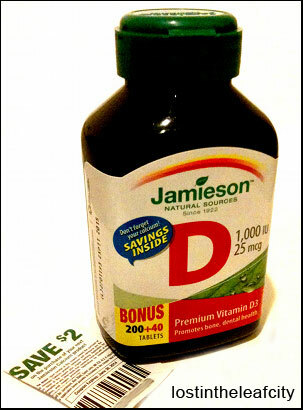 Although the sun is likely to shine all day, I have no intention of not taking my Jamieson Vitamin D.
So when I spotted a Jamieson Premium Vitamin D3 on sale, I grabbed it without paying too much attention to the extra bonus: save using $2.00 coupon for the next purchase of Jamieson Calcium product . The label says saving inside so perhaps there’s no way of missing it. (But somehow I did.) The coupon expires on June 14, 2014. Tip: Another trick in couponing is to look for on sale vitamins and slash another $2.00 off price. I’m using the coupon for someone who needs calcium supplements. As for me, I’m content of having a daily intake of milk or yogurt or cheese. Sometimes, I over eat foods thinking that I’m not having enough daily calcium intake. I find the $2.00 coupon in Shoppers Drug Mart, my favorite place to shop for vitamins using coupons. For the most part there’s no argument about the importance of taking vitamin D and calcium. Do you include vitamin D in your daily supplement intake or prefer multivitamins?